The £2 billion NHS funding gap made headlines this week. It’s a story we will probably hear every year from now on, with the amount getting slightly bigger each time. Two graphs from the King’s Fund report earlier this year explain why. 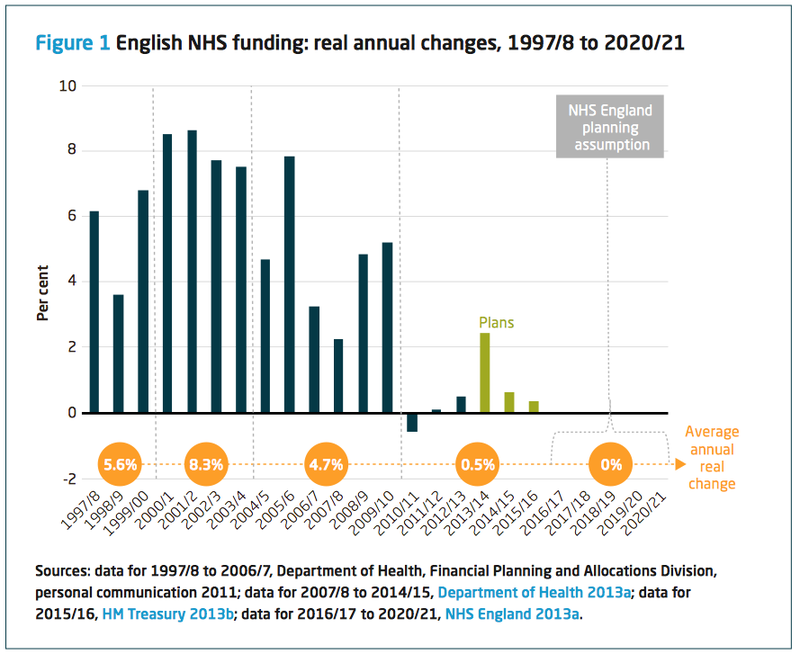 Firstly, the NHS isn’t getting anywhere near the level of funding it used to. The King’s Fund reckons, depending on how you measure it, rising costs and demand mean that NHS spending runs somewhere between 3 and 6 percent above the rate of inflation. In other words, it needs at least a 3 percent real-terms increase just to stand still. With a simple inflation-linked budget increase, then, eventually the NHS will either run out of money or have to stop delivering some services. Unless, of course, it can make up the difference through efficiency and productivity improvements. This brings us to the second chart. 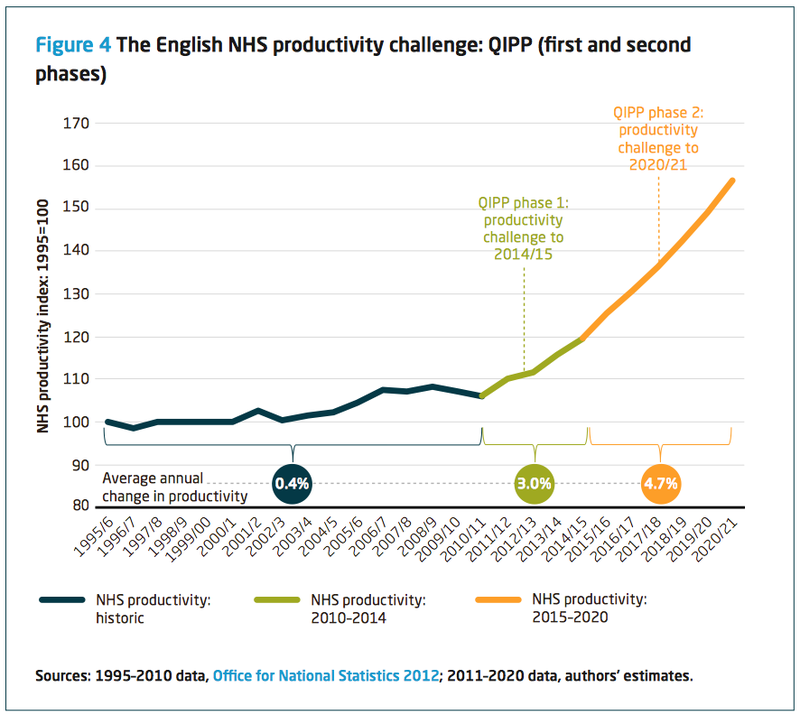 The productivity improvements needed are massive and way ahead of anything the NHS has achieved in its entire history. It is true, the service got off to a good start; 3.2 percent and 2.1 percent in the first tow years of the Coalition government. According to Andrew Street, this is the first time it has achieved savings in consecutive years for over a decade. But, while those numbers are heading in the right direction, they still don’t get us to an annual 3 percent improvement, let alone a 4.7 percent one. The trouble with year-on-year productivity improvement is that, after the first year, it gets much harder. Giles’s bloodletting analogy illustrates the problem. If you give a pint of blood, after a sit down for a few minutes, you’re OK. But what if the doctor said, “You seem fine after that. How about coming back tomorrow to give another one?” After a week, you’d be feeling very poorly. Taking cost out of organisations is a bit like that. Hit the easy wins in the first year, sack your contractors and cut your training budget in the second and, in the third, well, that’s when it gets really hard. 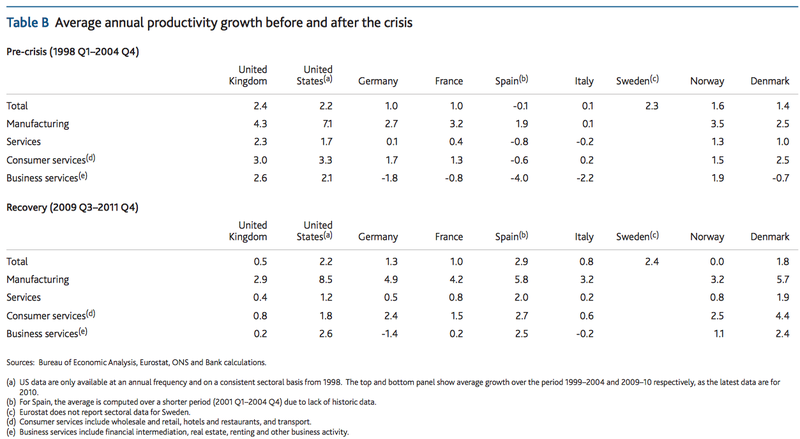 As this Bank of England report showed, across the major economies, for service organisations, sustained, year-on-year, sector-wide productivity gains of this size are extremely rare. There might be some great case studies and people doing some excellent work, but replicating their gains across the entire NHS will be difficult. We are asking a sector with very little history of making major long-tern productivity gains to achieve improvements that would be pretty unusual anywhere in the world. The question therefore is not whether the NHS will run out of money but when, and how this can be avoided. In a context in which organisations with a history of good performance are struggling to cope, there is every prospect that problems that have so far been found in a small number of providers will become much more common. The risk of contagion – of the NHS reaching a tipping point where only a minority of organisations are able to sustain acceptable levels of performance – is a clear and present danger. As with other areas of public spending, we are back to the 2015 dilemma again. Unless the NHS makes some near-miraculous productivity improvements, its protected budget will be nowhere near enough. It will either have to stop doing some things or we’ll have to stump up some more tax to keep it going. A good post. On top of the point that the productivity goals exceed private sector service industry benchmarks, the health sector particularly is prone to cost increasing technologies, and costs driven by demographic change – the ageing population has more illness so improving life expectancy comes with a cost. In most countries whether health spending is public or private as incomes rise the share of GDP on health goes up. Nobody wants to not have access to the latest drug or surgery breakthrough. As the economy recovers, a goal of maintaining the share of GDP on health at the average of other developed countries – as The government pledged back in 2000 – is the best way to avert a crisis of our own making. As with other public services, the extent to which productivity might improve the chances of closing the (wholly artificial) funding gap depends on your definition of productivity. If it is 1) squeezing more of the same outputs out for the same money, then there’s no chance. If it’s 2) Investing properly in the current country-wide speak about ‘Care Closer to Home’ and similar which allows over time people to get better outcomes from wholly different inputs and allows the closure of hospitals and other therapy places, then there is some chance. Early investment over a 5-10 year period, based on the costings of long term savings via not having to do expensive stuff has been mooted for local authorities (see p51 ad ch 10 of yesterday’s IPPR report) but nothing as solid as this has appeared for the NHS yet, not least as closing hospitals remains a BAD THING whereas in fact it can be a GOOD THING. Usual dumb remark Mr Dalton . No administration can cope with funding a ‘free’ (for all) health system . We don’t need to be knee deep in charts and data to comprehend the uncontrollable monster that is the ‘entitlement’ culture , so nicely illustrated by the above comment . Being the recipient of what is an over generous state pension (over generous because of 40 years of full but insufficient N.I. payments) , free prescriptions , a bus pass (for gods sake !) and numerous other benefits that I seem to have accumulated the ‘right’ to , I can clearly understand the dilemma faced . The Good and Honourable Mr Bevan nor anybody else , could never have envisaged what a monster it would all become . The NHS so quaintly celebrated at that opening ceremony is and has been for a considerable time , unsustainable . I frequently consider my fellow patients waiting for the next procedure as various bits wear out and wonder (probably aloud) at the cost of it all . I mean , I know my eye treatment alone stands at about £4000 annually and I wonder at the cost benefit of it all ! Its only one eye so I know Mr Dalton would certainly not waiver on that one as far as I’m concerned ! I have two (useless) suggestions . One , produce a genetically modified burger that would eliminate the feeling of ‘Entitlement’ and Two , clearly show the cost of all pharmaceuticals and medical procedures prior to ‘delivery’ . The latter , I would suggest , might be worthy of serious consideration . Few people uninvolved with the medical industry have any idea of the costs involved . Good luck with that and start preparing for some sort of partial contribution system coming sooner than later and probably imposed by the Imperial Government of China ! !